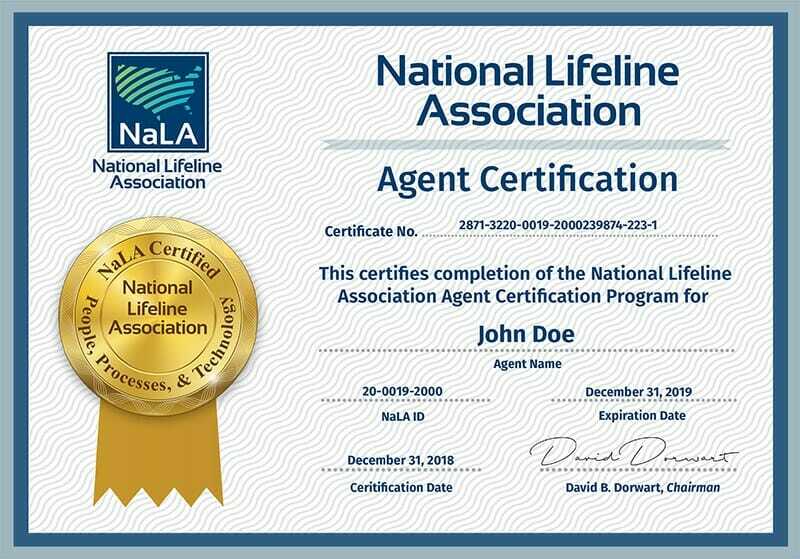 Please fill out your information below to enroll in the NaLA Lifeline Agent Certification Program or to renew your certification today! Important Note: Please fill out registration information to match your ID/Driver’s License/Passport. The NaLA Lifeline Agent Certification Annual Subscription is only $50 for the entire year! Complete the training course for just one annual payment of $50. Make Your Payment for the Annual or 6-months Subscription and receive your unique logins within 24-48 hours. Log in to complete your registration and take the 30-minute Lifeline training course*. Following the course, you will be required to take a 10 question exam. NaLA Agent Certification can be billed annually or every 6-months. The cost is $50/year or$18/quarter. Coupon codes from pre-payments will be assigned a monetary value associated with the discount on the initial pre-payment date. After the discount period has ended, additional payment may be required. *Taxes not included. Taxes will be calculated and collected at checkout. **NO REFUNDS. All training and certification sales are FINAL. No exceptions.